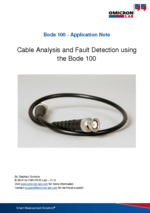 This Appnote explains how the Bode 100 can be used to measure cable parameters such as the cable's dielectric constant. Further on it is demonstrated how the Bode 100 can be used to determine the position of a cable break. For standard measurement situations in electronic labs most of the time only the impedance of a coaxial cable matters. But as soon as it comes down to special applications many additional parameters such as the cable's attenuation and its dielectric constant matter. In this application note we demonstrate how easily Bode 100 can be used to measure these important parameters.